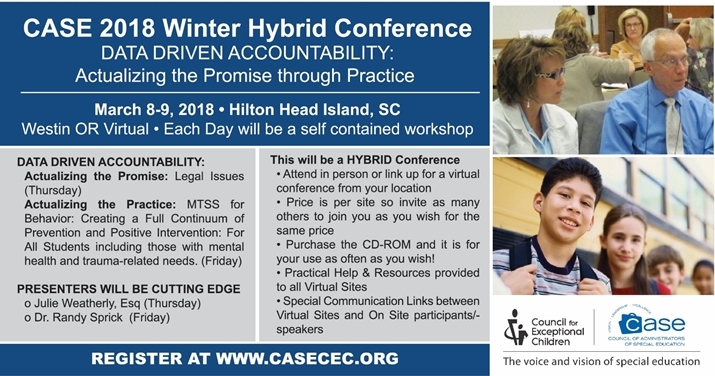 Start making your plans now to host a virtual site for the 2018 CASE Hybrid conference, March 8-9! We even will give you Hints on how to get it all together! This year we will once again have two extraordinary speakers and two different subjects — so you may want to invite different folks on the different days. Remember you pay one low price and can have as many as you can accommodate in your session! Last year we had 99 virtual sites in 36 different states! But of course, you can join us on-site at the lovely Westin Hilton Head Island, Hilton Head Island, South Carolina. Register today — and don't forget to add in the DVD for future use! Have you registered for the CEC convention in Tampa, Florida, Feb. 7-10, yet? For as long as I can remember, CEC has held its conference in April and for the last 15 years or so, it has conflicted with state testing programs! So, CEC leadership decided to move the conference to a time better suited for teachers and others connected with schools. The program will be amazing, and this will be a conference you do not want to miss. Check out all the information from programs to hotels to workshops at the dedicated conference website. Speaking of the CEC Conference — CASE NIGHT tickets are on sale and going fast! We are so excited about this year's CASE Night — a dinner cruise on Tampa Bay! The boat will leave just steps away from the convention center so no added transportation. Tickets will be $65 but remember it is sponsored so for that amount, you are really getting an event that is worth much more! Our very special sponsors are Star Autism and Sonday System! The tickets are limited so get your tickets today! The question last week was "Which area of low-incidence disability do you feel you need additional resources (e.g., training, information, instructional materials, service personnel, etc.)?" The number one area at 40 percent was deaf/blind! Coming in 2nd with 27 percent was Autism. At third place with 13 percent was deaf and hard of hearing. There was a three-way tie for last place at 7 percent between blind/visually impaired, intellectual disability and orthopedic impairment. Last week I shared the site for the Laurent Clerc National Deaf Education Center at Gallaudet University where you can get lots of FREE resources. But did you know that CEC has divisions that deal with these low incidence areas? Check out the other divisions and their websites for great information and resources for you and your teachers! I hope you have a great week and will continue to enjoy the brisk, cool fall weather! Remember to spend some time thinking about and maybe even writing a gratitude journal. I am grateful for my professional colleagues who have become my good friends! The Laurent Clerc National Deaf Education Center at Gallaudet University, located in Washington, D.C., is pleased to kick off our public input survey. The intent of the public input survey is to collect a diverse range of perspectives on areas of need in the education of deaf and hard of hearing children across the United States. Your perspective as a special educator and your role as a key stakeholder will help guide us in determining what resources are needed to support deaf and hard of hearing children across the nation, their families and the professionals who work with them. Urge Congress to eliminate sequestration caps to adequately support NDD programs! How's DeVos handling a big special education issue? Do education spending cuts spell trouble for the country? How well does your state support children with dyslexia? Does inclusion slow down general education classrooms? Almost all students with disabilities are capable of graduating on time. Here's why they're not.